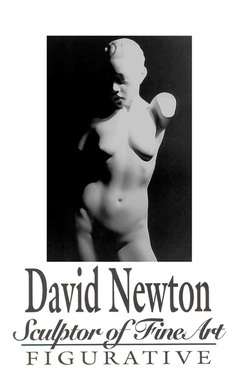 David Newton, a classically trained sculptor in the European tradition, has dedicated his career to transforming ordinary African American people and forgotten historical moments into unforgettable, timeless monuments of beauty. Born and raised in Detroit, Michigan, Newton was nurtured by a loving family who was struck by his outstanding talent when he was 10 years old. His fifth grade teacher recognized his talent and recommended that his parents help develop it by taking private art lessons from the prominent Detroit artist Charles Mcgee. David completed his undergraduate degree in fine arts from Detroit's College of Creative Studies and his Masters of Fine Art degree from the Graduate School of Figurative Arts in New York City. He also studied in Florence, Italy to more closely study the great masters such as Michelangelo and Donatello. Throughout his studies, he was also inspired to portray figures from his ancestral homeland, Africa. Newton's sculptures offer a refined yet modern interpretation of the African American experience. Admirers of his African statue, “The Sentinel”, at Freedman’s Memorial in Dallas, Texas who stand before this sculpture are made aware of the distant and powerful presence of the African American genesis. It is as if these bronze interpretations - these metaphors of many souls - have actually lived. Newton breathes life into his subjects by means of excellent design and historical detail while igniting each with dignity and magnificent humanity. Newton's sculptures represent great honesty and grand accomplishments. "Each artist must discover his or her own creative compass in order to find a wellspring of artistic inspiration. I am also inspired to depict African Americans in bronze - a color-blind medium - with hope that it may translate for others as a 'color-blind' interpretation of pure, distilled beauty, strength, grace, and form." Looking at Newton's bronze masterworks - such as Dream of Freedom, Violated Soul, and Echo - tell the tale of mankind’s immersion into the emotions of a stolen people. It is no accident that his art has become the voice of under- privileged citizens of this country - regardless of ancestry. Public commissions have punctuated his career for nearly two decades. However, it was the national search and selection of David Newton for the commission of Freedman's Memorial in Dallas,Texas that firmly placed him front and center on the national stage. His award-winning Freedman's Cemetery Memorial commemorates the lives of more than 5,000 freed slaves who were buried in a once forgotten cemetery. Newton's superb memorial guarantees that these formerly lost souls will forever be remembered in the universally honored spirit of triumph over adversity. This is a sentiment that all of humanity admires, and because of the genius, talent, and wisdom of master sculptor, David Newton, this admiration shall continue for centuries to come. When one stands in the presence of Newton's Freedman's Memorial, one feels ennobled. David Newton has a rare gift. He transforms flesh and blood beings into noble bronze symbols of struggle and freedom. This is a gift to be treasured.